'll probably build the beta Tool Store and stick in the alternate Teleport Pad for good measure. You might also use the ingame version of the released LRR which is still present in the files. On 17/04/2017 The LeoCAD file is not included with Small Mobile Laser Cutter so there are no instruction can you fix this? I second Oxman-21's question. I've always loved the Rock Raiders and I've tried recreating models from the games before but never done very well so your instructions have been AMAZING! It's a shame the Large Laser Cutter wasn't finished, but it'd be ace of you if you could provide instructions for the small laser cutter if you've got them. Topic updated, all files and images are now hosted on RRU so the links shouldn't break again. 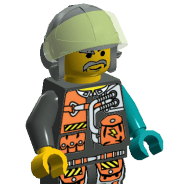 Have anyone tested to use the LDD-model in Lego Worlds? Does it work well anyhow? i am recreating those in lego digital designer but i cant find the black 2x2 plate with the yellow arrow on it. where can i find that one? Edit: This should get you started!